Through all of this, their love and their relentless enthusiasm kept them strong, and now they are sharing their unique and uplifting story with you. The twists and turns of fate, including an appearance on a TV home makeover show, brought Trudie and Lloyd closer together, and ultimately their courage brought them their most treasured dream; a family. Dreams Do Come True is a story of that courage, a story that proves that with love and determination, anything is possible. 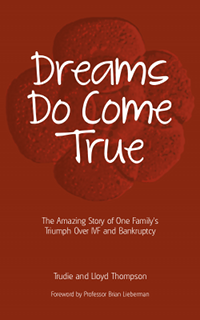 A share of the profits from this book are donated to support the IVF unit at St Mary's Hospital, Manchester, which gave hope to Trudie, Lloyd and countless other parents.